ESO Supernova Exhibition — What is antimatter? Antimatter is rare; it's only produced in small quantities and has a short lifetime. Yet the Big Bang yielded equal amounts of matter and antimatter. So why is there hardly any antimatter left in the Universe? Quest for annihilation: If galaxy clusters contained antimatter left over from the Big Bang, they would emit gamma-rays, produced by the annihilation of matter and antimatter. A search for gamma-rays from the Bullet Cluster came up empty. Credit: X-ray: NASA/CXC/CfA/M.Markevitch et al. ; Optical: NASA/STScI; Magellan/U.Arizona/D.Clowe et al. 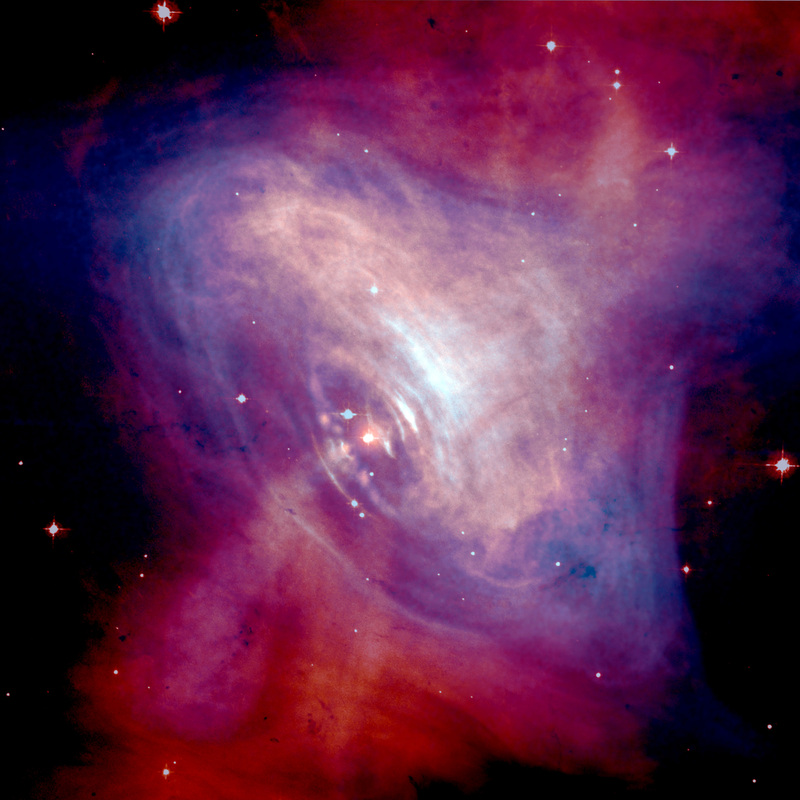 Antimatter gun: Particles of both matter and antimatter are accelerated in turbulent, X-ray emitting jets in the Crab Nebula, the remnant of a supernova explosion in 1054.
Credit: NASA/CXC/ASU/J. Hester et al., HST/ASU/J. Hester et al. Antiatom: Each elementary particle has its own antiparticle, with the same mass but an opposite electrical charge. Antiprotons and antielectrons (positrons) can combine to form atoms of antihydrogen. Antimatter in itself is no mystery. For every type of subatomic particle there’s a corresponding antiparticle with the same mass but with opposite electric charge. Antimatter is produced in particle accelerators on Earth, and in energetic environments in the cosmos. In a sense, the existence of normal matter is the real mystery. The Big Bang produced equal quantities of matter and antimatter. Almost all of those particles annihilated each other, but a tiny smattering of normal particles remained, making up our current Universe. No-one knows the cause for this one-in-a-billion level of asymmetry; it is one of the biggest unsolved problems in modern physics. Particle brake: At CERN, the European Organisation for Nuclear Research, giant magnets are used to slow down antiprotons which are then sent to instruments that study their properties. Don't touch! If you shook hands with someone made of antimatter, both of you would instantly disappear! Luckily, there's very little antimatter in the Universe. The problem is that no-one knows why.